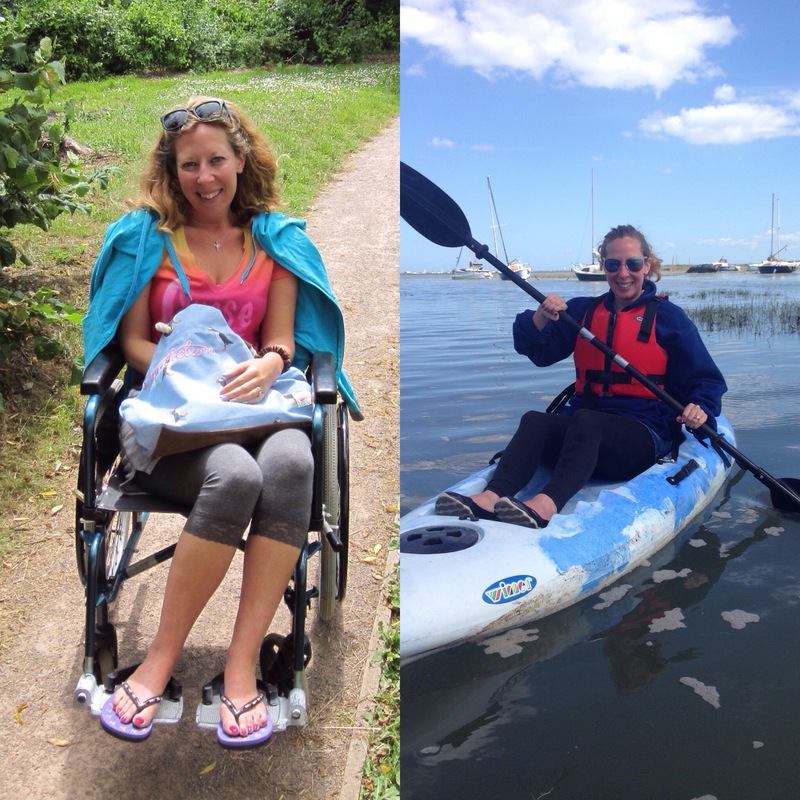 When I was really ill in 2013 and back in my kayak in 2016! I’ve had a personal journey with ME/CFS, POTS and Fibromyalgia for almost five years. I was diagnosed with Hypermobility syndrome in 2009. I had my crash in early 2013, after a steady deterioration in 2012. I became more and more unwell, and carried on at all costs. I got steadily worse throughout 2013, traversing into a dark place, where I became housebound, highly depressed, with severe anxiety, all before I was diagnosed, eventually in spring 2014. I initially presented with vitamin and mineral deficiencies and huge fatigue, before my sleep eventually stopped and I had wide spread pain. It’s hard to remember those initial years, they are a fog. But by then end of 2014, I was at rock bottom, stuck on loads of different pills, that didn’t work, quite suicidal, and will took over. I didn’t know how, but I slowly created a plan to get my life out of this dark hole. By 2015 things weren’t good by I was trying everything. I developed a system and learned as I went both physically and mentally. Little did I know, I was on a journey into deep transformation within myself, and for myself. Slowly I came to my own rescue, and things, moving at snail pace, began to take shape. By 2016, I was coming more into the world again, and by 2017 I was really integrating back into life. Unbelievably I had been walking steadily into a new horizon, and without knowing, I had been laying a seriously firm foundation for my new / revised life. Yet this time, I wasn’t quite the same person returning. Something had shifted. I was connected to myself. I am still on my own journey, and now I’m coming full circle, yet also into a whole new landscape, I’m learning why this journey was always meant to be, and how much it has given me. I am in a far different place to where I was in 2012. At the most difficult stages I thought I was lost forever. Clearly my mind was wrong and my spirit was thankfully, indomitable. Please believe your circumstances can change, because I was diagnosed with moderate to severe ME. In the initial stages for around a year, I was bed bound / house bound. I used a wheelchair for eight months and needed help with washing my hair and daily living. Within this entire period, there were times I suffered greatly but equally I was presented with much opportunity and ever increasing passages of freedom and peace. This life changing period has forced me to embody my previous psychological training and spiritual disciplines, leading me to more personal satisfaction than I could have ever imagined before I got ill. I’ve had to find a way to master my own psychology which had previously alluded me to some degree, despite my psychology background and three years of psychotherapy. I’ve been forced to find new ways to take action and to end the fears and insecurities which were holding me stuck in cycles, particularly around fearing symptoms and relapses. Equally I had to learn to really come to love and nourish myself so I could return to a new, more sustainable and healthy way of life, which continues to evolve. Before the ME/CFS experience, I always enjoyed motivating people to find out more about themselves and their unique path. Inspiring individuals to reach greater personal empowerment has long been my passion. Equally I find self-development to be a rewarding avenue for positive transformation, even more so now! I have a background in teaching and counselling both with children and adults in a variety of settings and have worked within the education, charity, public and health care sectors. In addition to being a trained psychotherapist I have training in a number of holistic alternative therapies. I’ve been involved in event management and teaching / speaking at educational events since 2006 and I can see a vision of one day getting back to leading some inspiring workshops, all about demonstrating that you CAN RECOVER FROM M.E. / CHRONIC FATIGUE SYNDROME! Having faith that you can get well can be so hard when the outside world seems so far away, but with little steps, lots of knowledge, hope and a different approach to life, miracles do happen! I am so grateful for all the things I once took for granted and for growth lessons which have aided me in becoming a better friend to myself and in finding my sense of personal power. I now look forward to helping others on the road to their recovery.